1. Be understanding and generous with time. 2. Be forgiving of yourself and others. We all make mistakes but turning them from molehills into mountains does no one any favours. Learn to be humble. 3. Become the most positive and enthusiastic person you know. 5. Commit to constant improvement and quality. 6. Happiness is not based on who you danced with last, - but on relationships with people you respect and love. Similarly, it is not the end of the world if you have a night of few (or even no) dances. It is just the way it happens. Enjoy the company of those around you and make new friends. 8. Take good care of the ones you respect and care about. I've been to 2 Christmas milongas in the last week where presents were handed out to everyone... well almost everyone. At the first milonga which was Tango Embrace at Avalon's RSL everyone got a present! Quite an amazing feat on the part of the organisers Margarita and Guy and a very sweet thought. At the second, last night organised by Sydney's Tango Club, everyone was asked to bring a present worth $10 and mark it for a man or a woman. Well of course not everyone did - there are always those who don't participate for reasons often unfathomable, and even though the organisers chipped in with a few extras not everyone got a present, but it was good fun. This is a first for me in all the years (8) that I have been in the tango scene...a very nice gesture! A big thank you to everyone who came last night to our Blue Tango Birthday night for the Milonga de Mis Amores. Everyone got into the spirit of the night and it was really lovely - and blue!! My only regret - no Opera (renamed tango) cake left to take home. It was all devoured. As were the Blue Tango cocktails. The Gladesville RSL are fantastic, wish they would let us stay past 12. I love organising milongas... and I put heaps of time and energy into it cos I only do one a month(well to be honest I love organising, but when it's something I enjoy it's even more fun). This weekend we are celebrating a year at a fantastic venue - Gladesville RSL, doesn't sound too glam but they have a great ball room which we have exclusive use of with it's own bar and an excellent restaurant in the next room. We feel very fortunate when so many venues have shut down so we are making the most of it. I have chosen Blue as the theme, simply because I love blue... and have found blue candles, blue lighting and had a blue tango cocktail created especially for the night. At the Glebe Street Fair tomorrow, Sunday 15thTango Bar quartet will be playing live music from 12-3pm at Junktique. There will be chairs and tables set up on the street as well as around the dance floor, and waiters in costume serving snacks, coffee and wine. Junktique is full of fabulous old chandeliers, furniture and vintage pieces which will help to create an atmosphere of nostalgia and elegance - combined with a fabulous sound system it should be a great space for tango. So asked my friend Shayne of blog about romance writers and ocean swimming...I wish I could say I've been to London to visit the Queen, but I've actually been dealing with the sudden death of both my computers! They went out in Sympathy with each other. One is back - well I have one new one, and a new desktop on the way. Just in time as I was busily working on music for the next Milonga de Mis Amores on Saturday October 24. I have just acquired a fantastic new Miguel Calo, a dreamy Demare, another Di Sarli (can't get enough of this orquesta or Canaro) and a Juan Caceres... just out of interest. But transferring itunes to a new computer is another ball game... so that is what I am doing now, and checking playlists. Thanks for asking Shayne, though I'm glad you missed me! Oh I did manage to fit in one night of dancing in the last week! Wow! Sydney turned out in force for the Milonga Para Los Ninos last night at the Marrickville Hard Court Tennis Club and the vibe was warm, friendly and fun! (For those new to this blog, or not following! this is a fundraising milonga held once a year in cities around Australia - and now north America! - to raise money for homeless children in Argentina). I arrived early as I had volunteered my services as a member of the Tango Synergy Club, and even though it didn't start officially until 8pm there were already 2 or 3 tables of eager dancers and a few on the floor. The internet seems infinite, just when you think you've found most of them a another great site turns up. Today I discovered El Firulete. Stories are good, well-researched and well-written - and interesting! I found an interview with Gabriela Elia, one of the judges with the Salon section of the recent Tango championship in BsAs very interesting ... for example "This year only young couples reached the finals. That’s wonderful, but they all danced the same way. It is not their fault, it is the style that is being awarded." ..."We should have been 10 feet from the dancers, and not to 60 feet. The salon tango is a reflection of the milonga, and as such it has to be appreciated form a close distance"..."There were too many people in each round, 11 couples dancing three tangos is too much". We're putting together the last bits into the TangoAustralia October newsletter... if you aren't on our mailing list, you can subscribe now - it's free and packed with news about what's happening. Congratulations to Sophia and Pedro Alvarez from Patio de Tango on an excellent impromptu performance on the Today Show on Channel 9 this morning. The story was about tango being good for relationships and in usual morning television style was a light weight grab but Pedro and Sophia did an excellent job of presenting their love of tango and its role in their relationship. I know it was impromptu because I received an email yesterday morning asking me to find the show a tango couple and because I was out of the office I was not able to assist! Less than 24 hours notice. Last night I attended the official opening of an exhibition by tanguera and artist Ursula Kolbe at the Charles Hewitt gallery in Sydney. "When I remember you, beloved tango" is an exhibition of paintings and sculptures inspired by Ursula's love affair with tango over the past few years. If you expect paintings of couples dancing in the half-light of the milongas in Buenos Aires you will be surprised. These paintings are mysterious, reflecting the moods of tango, the words of tango songs and the feelings of this tango artist. Taking tango shoes, much loved by local tangueras, but no longer worn, Ursula has brought her unique artistic skills to this new medium, provoking emotions that are, in some cases, quite confronting. If you are in Sydney between now and 15th September do take the time to visit this exhibition - it will have you thinking about your tango experiences. Charles Hewitt is at 335 South Dowling Street, Darling hurst. Hours are Mon-Sat. 10am to 6 pm. It is with vicarious pleasure that I am following the Tango Festival in Buenos Aires - and here for the pleasure of others who cannot be there are some highlights. It began on 14th August. 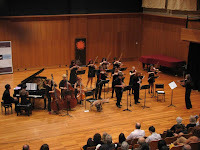 This video is a performance at the Teatro Avenida by Orquesta tipica El Porvenir, which is a youth orchestra made up of students from orchestras around the country and features Pablo Agri on the violin and dancers Gallo Ciego and Agustin Bardi. I also found this video of Daniel Nacucchio and Cristina Sosa who danced on the 15th August. Many Australians will be know these dancers from their recent visit. So much happening - check the program - and most of it is free. Our plan was to be there but circumstances prevented it so it is wonderful to be able to catch occasional highlights on Youtube. I'll post more as I find them. "What makes me wretched is that all these stunts, acrobatics, point-scoring and flashy displays of sexual availability are what matter. Musicality, phrasing, intimacy and actual sensuousness are what don’t." is the NY Times critic's summation of 'Burn the Floor' a dance performance in Manhattan choreographed by Australia's Jason Gilkison. I find his critique interesting as although I am constantly awe-struck at the acrobatics on shows such as 'So You Think You Can Dance' or the acrobatics performed as part of Stage Tango, I am rarely moved. He does not enjoy the tango which he describes as using 'every mock-tango ballroom cliche' and describes the performances as degrading the women and making the men look 'crassly manipulative'. What do you love about tango? This morning one my sons popped in for a chat - and we talked about what makes you happy (we've had a rotten year - with the loss of 2 members of our family, sickness and financial woes so it seemed appropriate). Then I read Arlene's blog - Why People Leave Tango/Why People Love Tango... and it made me think that we (myself included) gripe about the tango scene, but we hang in there. Why? Why do you love tango? Tonight I am starting on the playlist for the Gladesville milonga on Saturday. Methinks 45 minutes of canyengue may be too much for most dancers though this was the suggestion at the workshop I went to on the weekend. Since the teacher of this workshop is not coming to the milonga as far as I know, I will keep it to two tandas. Not sure I enjoy dancing canyengue yet. Naturally a tense person, I find I am holding myself in an awkward position - though I do enjoy the music. Just like all tango - it needs practice, practice, practice. - Love to have more comments on the championship too. Some people have told me what they think but haven't entered the debate! Pity because I think it really needs serious discussion. It's over for another year, the Australian Tango Championship finals took place last night in Sydney and now Australian tango dancers know who the winners are. Both the couples who won are professional tango dancers who make their living from dancing and teaching tango - the couple who came third are a young couple I watched with admiration on the floor at the Wellington festival. Sadly once the competition was opened to professionals it was obvious that amateur couples would not - and could not win, something which you may feel strongly about. Argentina has been severely affected by swine flu - known as Gripe A in BsAs. I am delighted that I have persuaded one of my regular correspondents in Argentina to write a report on how it is affecting the milongas - and the dancers in Buenos Aires. As the weekend of July 11 draws closer most of the chatter at milongas or gatherings of tango friends is about the Tango championship - are you dancing/going, or aren't you? and the community in Sydney seems to be divided - as our poll is showing. (If you haven't voted please do). A huge amount of work has gone into setting up this blog - Tango Teacher and DJ reviews ... and I would hate to moderate it! it is an ambitious project. If it gets off the ground I hope it will avoid the vitriole and self-righteousness that surfaces in some tango forums. Check it out. The cabaceo is having a resurgence in Sydney at one or two milongas. For those who don't know what this is if you Google 'cabaceo' you will get 2 websites that offer explanations for this tango ritual. Taken from the Spanish cabeza (head) it describes a method of a man selecting the woman he would like to dance with by making eye contact, then when she reciprocates, moving his head to indicate he wants to dance with her. She can refuse by looking away. Said to have been initiated in the days when young women were chaperoned at milongas, and described as being the best way for men to ask women to dance in a crowded milonga, it is still used in some milongas in Buenos Aires. It can work both ways, according to the experts - a woman can do it too. I never got round to writing up the next 4 days of the Festival. When one does not usually dance 3 to 6 hours a day, and go to a Milonga at night, fatigue takes over - and socialising is always more important than writing in this situation. So... here are my thoughts for what they are worth - and I would love others to write what they thought! Australians who are gearing up for the 2009 Tango championship will be interested to read what TangoCherie has to say about the finals just held in Buenos Aires. The championship has changed its name to Campeonato de la Ciudad. Cherie has also added a Youtube link which you will want to watch. Outside the air has a biting chill thanks to the polar front, but in the workshops at the New Zealand Tango Festival the air is buzzing with the warm bodies of dancers who are swapping accounts of the different workshops and practising their new skills. We arrived in Wellington, New Zealand's capital, yesterday and spent the day exploring the city, visiting the Botanic Gardens and riding on the public transport, but today we got down to business. It had to happen sooner or later - the Australian Tango Championships return. I only know because I checked my Facebook page and found the announcement. As one who was very closely involved with the first 3 of the Championships I will watch with interest. I do most sincerely hope that this time they are a truly national event. Sydney has a bigger tango community than any other city but this is not a good reason for holding the championships here every time - in fact the venue situation in Sydney makes it a challenge. We used the Sydney Opera House for the first 3 and with the last event our ambitions got the better of us when we used the Concert Hall. Not that it wasn't a successful event in the eyes of those who watched and those who had the unique experience of dancing on the stage of our harbourside icon, it was. For those of us who were closely involved it was not a satisfactory experience. We've been through a recession or two before and I have decided that despite the fact that much of my freelance work has dried up I am not going to let it stop us doing some positive tango stuff this year - what goes down has always in the past gone up! So we are doing a promotion with the Gladesville Milonga de Mis Amores and running a competition to win a return fare to Buenos Aires with the travel agency, Travel Choice. When you attend the milonga you get the opportunity to fill in a form for the competition (one per person, per milonga) and in June we will draw the winner! This is a joint promotion for the travel agency, tours and packages to South America, and the TangoAustralia website. Recently some Sydney milongas have made chacarera an interval in their milongas - sometimes following or preceding salsa, sometimes on its own. Why? I can understand the salsa as many Sydneysiders dance salsa and those that do love the opportunity to dance it. But chacarera? Most Sydneysiders have no idea how to dance it so, if they are brave enough, they get up and wave their arms around, stamp their feet and dance in a circle... endlessly it seems to me at times. Chacarera is a dance that has no real beginning or end in this form - it is just an endless stomp. Having seen real chacarera, both here with visiting performers and in Argentina, I know it can very entertaining and is a skillful dance. However I find this interval rather boring... am I alone? What do you think? Does this happen in other places? In my experience only a handful of couples get onto the floor...please comment - and answer the poll. So if you are interested in news about festivals, schools, bands etc. then do subscribe - you'll find the subscription box on the home page of TA! There's news on the NZ Tango Festival in Wellington which has a fantastic line-up this year and if last year's rave reviews are anything to go by, it should be brilliant. Well worth the airfare to NZ - and it is excellent value. News on new tango bands too. 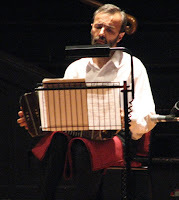 I love Piazzolla but I do wish they would all play more music for dancing, I like to listen to Piazzolla. You may not agree of course.